A dental crown replaces a visible part of a tooth in case it has been damaged, fractured, malformed, discolored, or if it has to be extracted. It is made on the basis of the imprint so it fits perfectly with the natural dentition and presents a solution that is both functional and aesthetic. In Belgrade, dental crowns are fabricated in modern laboratories. Fabrication is assisted by a computer which allows dental technician to design the crown with an impeccable precision. A dental crown can be fabricated in metal, porcelain, or mixed, porcelain-fused-to-metal crowns. 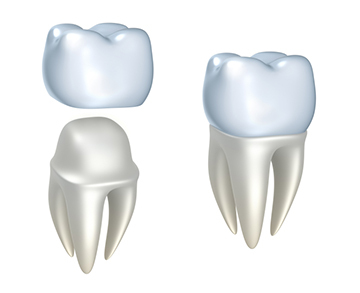 Metal crowns are very resistant, the most economical but also less attractive. Therefore they are rather reserved for out-of-sight molars. Since the metal crowns are often made in nickel/chromium alloy, it is not recommended to patients allergic to nickel. PFM crowns have the metal structure that is fully covered with porcelain. That makes them as much as strong as metal crowns and in the same time a perfectly aesthetic solution. Thus, the PFM crowns can be used to replace both, posterior and anterior teeth. All-porcelain crowns are made entirely in porcelain, and have a structure in porcelain or zircon. They look completely natural but they are more fragile because of the absence of metal. Therefore these crowns are indicated for front teeth and for metal allergic patients. The crowns are placed on the natural tooth that is reshaped in order to receive the dental crown, or on dental implants.